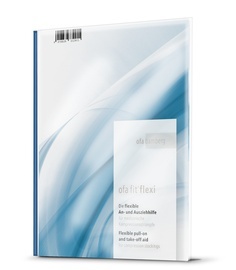 Ofa Fit Flexi is an aid for putting on and taking off compression stockings, made of tear-proof canvas. The high-quality, particularly smooth material, makes it easy and quick to slide the compression stocking over the foot. The pull-on aid is easy to use, ultra-light in weight and can be folded to handbag size; therefore, it is ideal for on the road. Start the day with a smile. 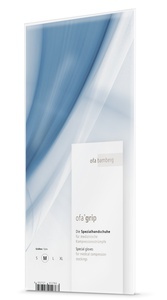 The Ofa Bamberg donning aids allow you to glide into your compression stockings effortlessly and with ease. Ofa Fit Flexi fits into any handbag and is ideal when out and about. Ofa Fit Expert is the perfect aid where personal mobility is restricted. Both can be prescribed by a physician. The donning aid is made from an extremely light and tear-resistant material as also used in sailing. The high quality material is particularly smooth and allows the compression stocking to glide with ease and speed over the foot. Watch our video and find out how to use the Ofa Fit Flexi. Ofa Bamberg stands for the most modern technology in combination with more than 90 years of experience in medical compression. And not only development is based in Germany. We are particularly proud of the fact that also production is almost exclusively “made in Germany”.